Reverie produce a range of autoclaved seats from single skin (matt black finish on the rear) to twin skin (moulded polished front and back shells bonded together to make the ultimate stiff light monocoque seat. 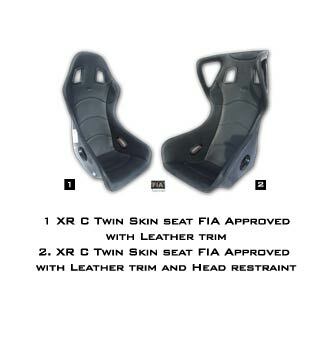 We make low back versions suitable for older sports cars to fully approved amazingly light FIA approved racing seats. Our FIA approved seats have been impact sled tested in excess of 20G. With the FIA seats you have the option of Velcro on trim pads or a fully trimmed seat front. A range of seat cushions (in narrow or wide) or full seat trim options (FIA only) are available for use with the seats such as FIA approved (fire resistant) spacer fabrics, genuine leather or Carbon fibre embossed effect leather. Trim is available as cushion kits or, on some models, full seat trim. A size guide for our seats is available here! Some examples of fitted seats are available in the gallery. If you have any questions regarding our seats do not hesitate to contact us.